Mark your calendar for the American Numismatic Association’s (ANA) World’s Fair of Money in Denver, Colorado. The annual event offers access to hundreds of dealers, spectacular exhibits and fun social activities. The convention takes place Aug. 1-5 in Hall F of the Colorado Convention Center, located at 700 14th St. Collectors are encouraged to explore the freshly updated World’s Fair of Money page for discounts, learning opportunities and a full schedule of events. The coin and money show features the nation’s finest coin dealers and best inventory; high-quality educational programs and seminars; world-class auctions by Heritage Auctions and Stack’s Bowers Galleries; mints from around the world; as well as exhibits showcasing priceless treasures from the Money Museum and private collections. Show hours are 1 to 6 p.m. Aug. 1; 10 a.m. to 6 p.m. Aug. 2-4; and 10 a.m. to 4 p.m. Aug. 5. ANA members can enter the show 30 minutes before the public. Admission is $8 for adults; ANA members and children 12 and under are always free. Last admission is 30 minutes prior to closing. Association members who register by July 21 will receive member credentials in the mail. Member badges provide show attendees access to the bourse floor 30 minutes prior to the show opening. Big High and Bid Often! Show attendees interested in becoming wiser collectors are encouraged to sign-up for the ANA’s pre-convention Technical Series Seminars. Both seminars will take place at the Sheraton Denver Downtown Hotel, located adjacent to the convention center. Date and Time: July 29-31; 9 a.m. to 5 p.m. This intensive three-day seminar emphasizes the most essential numismatic skills for collectors of any level. Instruction includes digital presentation, open discussion and hands-on coin examination. Date and Time: July 30-31; 9 a.m. to 5 p.m. 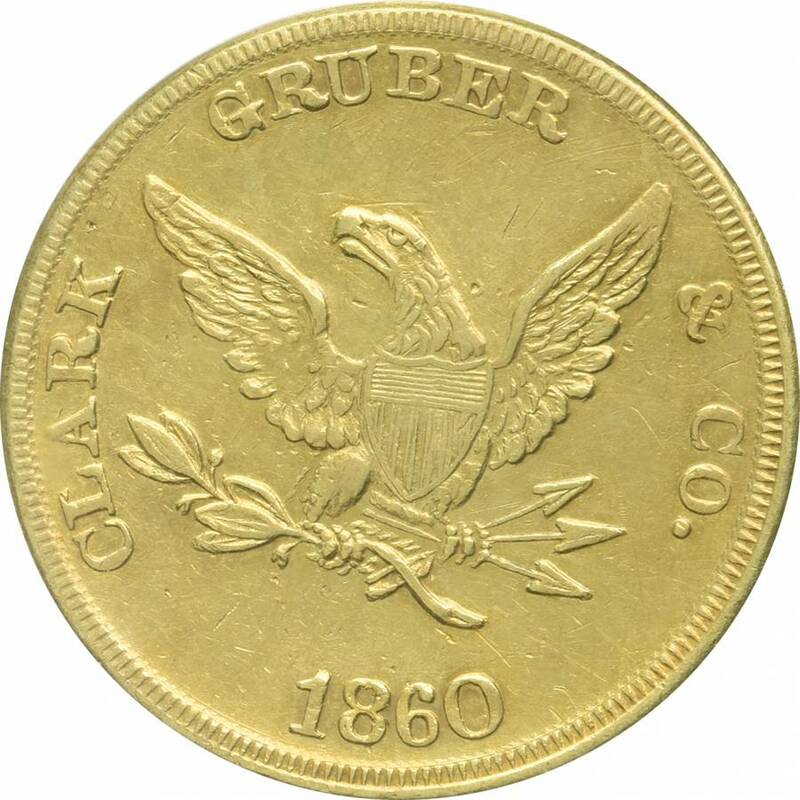 In the 19th century the discovery of gold across the U.S. led to a fascinating series of coinage produced by the U.S. Mint, the U.S. Assay Office and private minters like Bechtlers and Moffat & Co. Learn the history of the three major U.S. gold rushes through coins minted from Georgia, North Carolina, Colorado, Oregon, Utah and California. Examine high-resolution images and actual examples of rare Pioneer Gold! Convention visitors are also invited to attend the free Money Talks presentations and Sundman Luncheon lectures. The informative programs are presented by some of the hobby’s most noted authorities. Money Talks presentations are offered Thursday, Aug. 3 and Friday, Aug. 4, in Room 504 of the Colorado Convention Center. Topics to be covered include: Baltimore’s Washington Monument and Its Numismatic Secrets; Medallic Remembrances of World War I; Lesher Referendum Dollars – The Denver Connection; and more. The Denver World’s Fair of Money is the perfect venue to socialize and network with fellow collectors in a fun, friendly atmosphere. The ANA welcomes hobbyists to the following social events. Legacy Series — Join the ANA as it celebrates the contributions of Colorado father-son coin dealers, Ken and Tom Hallenbeck of Hallenbeck Coin Gallery. Learn about their personal interests and how the two men have shaped the Colorado Springs numismatic landscape. The cost to attend is $50 and includes hors d’oeuvres and a cash bar; registration closes July 18. ANA Member and Donor Reception — The always-popular ANA Member and Donor Reception recognizes 25- and 60-year members, lead donors, Dealer Booster of the Year, John and Nancy Wilson Member Booster Award, Century Club inductees, and service awards. This is a great event for members to meet new friends and catch up with old acquaintances. Admission is free. ANA Banquet and Silent Auction — The fellowship gala of the year, the annual ANA Banquet includes a cocktail hour for mixing and mingling, a three-course dinner, presentation of ANA awards, and recognition of 50-year members. Tickets are priced at $110. A Silent Auction during the banquet raises funds to underwrite full and partial adult scholarships to the ANA’s Summer Seminar. Banquet registration closes July 18 (tickets will not be available for purchase at the show). A Golden Day at the ANA — In celebration of the 50th anniversary of the ANA’s headquarters dedication, the Association is opening its doors and inviting members to tour its center of operations in downtown Colorado Springs on Sunday, Aug. 6, immediately after the Denver World’s Fair of Money. Round-trip shuttles from the Sheraton (host hotel) depart at 9 a.m. (with departure from Colorado Springs at 2 p.m.) and 10 a.m. (with Colorado Springs departure at 3 p.m.). The cost for transportation is $30 per person; attendance at the celebration is free, although registration for transportation is required by July 18. 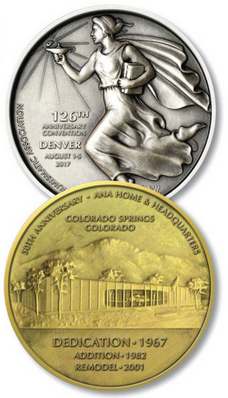 Commemorate the ANA’s 126th Anniversary with a silver or bronze Convention Medal. The 2017 medals are sponsored and struck by Medallic Art Company from the original 1982 (obverse) and 1967 (reverse) headquarters dedication medals. Medals are available as a convention medal badge (1.5” bronze medal with a ribbon drape) $20, Bronze Medal (2.75”) $65, or as a two-medal set for $100. To order, call 800-514-2646 or visit the Shop the ANA area (booth #1103) at the show. Collector exhibits are among the most popular features at every ANA show. It’s a great opportunity for hobbyists to share their collections and research with fellow numismatists through high-quality displays. The individual creativity is often rivaled only by the quality and variety of the items on display. Visit booth #778 to view this year’s exhibits. The host clubs for the week-long event, Colorado Springs Coin Club (cscc.anaclubs.org) and Colorado Springs Numismatic Society (csns.anaclubs.org), can be found at booth #362. For additional information visit www.worldsfairofmoney.com or call 800-367-9723.